For the larger‑than‑life personalities now staking their fortunes on the development of rocket ships, the new race to explore space could be a dead end, a lucrative opportunity — or the key to humanity’s salvation. Elon Musk and Jeff Bezos take center stage in this fast‑paced narrative as they attempt to disrupt the space economy, feed their own egos, and maybe even save the world. We also meet a supporting cast of equally fascinating entrepreneurs, from the irrepressible British mogul Richard Branson to satellite Internet visionary Greg Wyler. All are united in the profound conviction that commercial space transportation will transform our world for the better. Tim Fernholz’s fly‑on‑the‑wall reporting captures an industry in the midst of disruption, as NASA seeks to preserve its ambitious space exploration program, traditional aerospace firms like Boeing and Lockheed Martin scramble to adapt to new competitors, lobbyists tussle over public funds and lawmakers try to prevent this new space race from sparking global conflict. 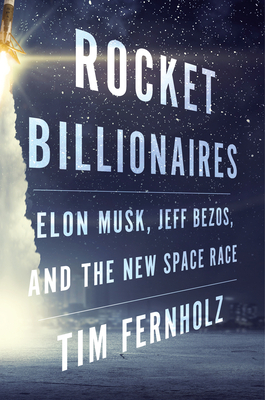 With privileged access to top executives at SpaceX, including Musk himself, as well as at Blue Origin, NASA, Boeing, Lockheed Martin, Orbital ATK, Virgin Galactic, Fernholz spins this high‑stakes marathon into a riveting tale of rivalry and survival.